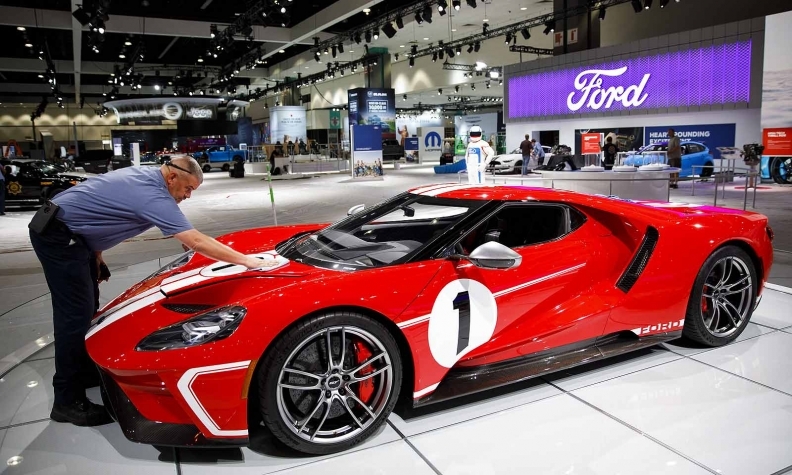 A 2018 Ford GT 1967 Heritage Edition at the Los Angeles auto show in Nov. 2017. Multimatic Inc., the Canadian supplier that builds the Ford GT, hit only 55 per cent of its production target for the 2017 model year, although it still plans to complete every order for the US$450,000 supercar. The company built 138 GTs, well short of the 250 that were expected, Ford confirmed this week, citing minor supplier problems and Multimatic's inexperience with the scale of the project. "This is a hand-built supercar, which we are committed to deliver flawlessly," a Ford spokesman said in a statement. "We built into our process an extended ramp-up due to several factors such as global homologation testing and supplier constraints." It's unclear how much longer Multimatic will take to complete the orders. Ford has said it plans to build 250 GTs per year through the 2020 model year, and the Multimatic plant in Markham, Ont., has been producing one a day for about the past year. The supplier is expected to hit its goal of building 250 GTs for the 2018 model year. The first production GT -- earmarked for Executive Chairman Bill Ford -- rolled off the line in December 2016. Motor Authority first reported the GT shortfall, citing an online message board. Ford plans to reopen order banks for fourth-year GTs in the fourth quarter. Those who applied and were not chosen during the first window can reapply and update their resumes, a spokesman said. The application process favors current GT owners and Ford loyalists to ensure the new cars will be driven on the road and not stored or flipped for a profit. Ford received more than 6,000 applications for the first 500 vehicles. Production of the third-year vehicles was set aside for applicants who were placed on the waitlist for the first batch of supercars. A number of celebrities have received vehicles, including Houston Astros pitcher Justin Verlander and professional wrestler John Cena, who ran into legal trouble when he tried to flip the vehicle but has since settled a lawsuit with the company.